I have recently (and reluctantly) returned from an amazing three week trip to London, England and Edinburgh, Scotland. 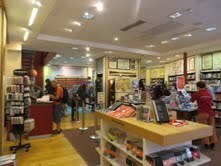 While in London, I couldn’t resist exploring all the amazing bookstores in Piccadilly. Being in another country, it was exciting to see some of my favorite authors’ books with different covers and looking for that gem that hasn’t been released yet in the States. Stanfords specializes in travel books, guide books and maps. I bought a beautiful antique-ish map of downtown London. The travel information is extensive and patrons are found engrossed in planning their next adventure. 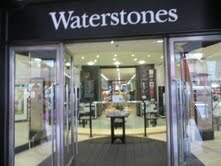 Waterstones is Europe’s largest bookshop with eight floors!! Six of which carry books galore. You can also venture to the top floor and have lunch or a cocktail at 5th View Bar. There was just way to much to look at to take any decent pictures. Just imagine B&N on steroids! But after all the exploring, I was still searching for that little gem of a bookstore. Where you walk in and can smell the history of the old pages and be impressed by the architecture. So, I asked a local where I could find such a place. 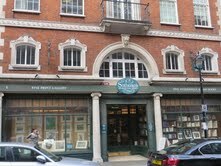 I was told about Hatchards. 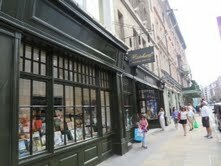 It is the oldest bookshop in the UK established in 1797. 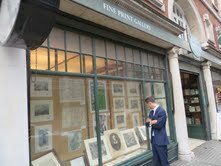 It even has some antiquarian books by Winston Churchill! This place was amazing and I didn’t want to leave. 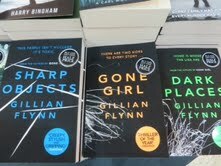 Tags: bookstores, London. Bookmark the permalink.